"The Perfect Drug" (also known as Halo 11) contains several remixes of the song "The Perfect Drug" from the Lost Highway Soundtrack. 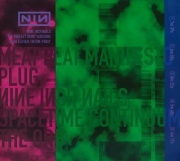 Most of the remixes are from artists other than Nine Inch Nails. * The original version is only available on various international releases. A sixth remix, by Aphrodite, is available only on the triple 12" DJ release. Remix and additional production by Jack Dangers; Engineered by Josh T. Roberts at Toast Studios, S.F. Previous release - "Further Down The Spiral" Halo number: 11 Next release - "Closure"